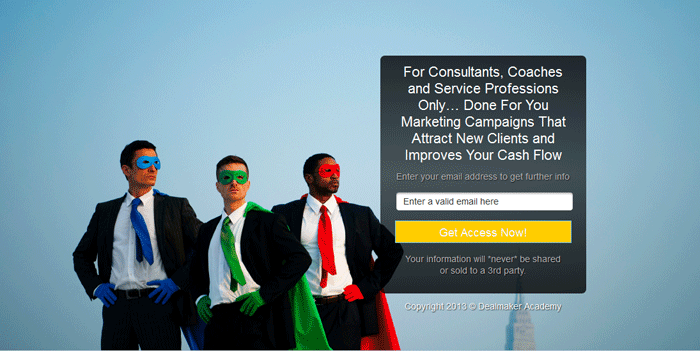 Similar to a landing page, a squeeze page only has one conversion objective for the visitor: capture an email. Unlike a landing page though, a squeeze page is typically shorter and requires less information to complete, usually just an email. True to its name it’s meant to ‘squeeze’ information from a visitor. What makes this squeeze page work? 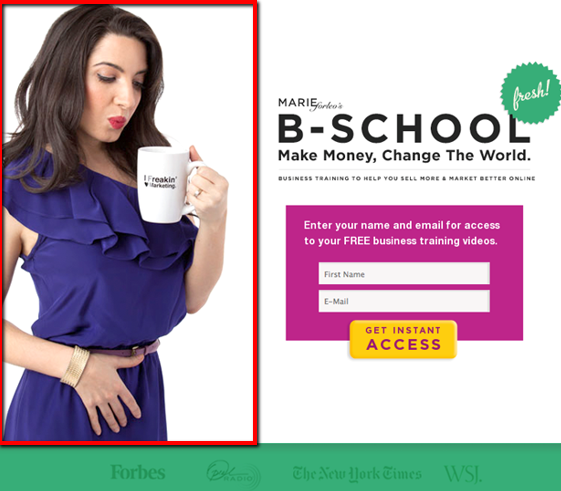 Personable: The large image of a professional female represents Marie Forleo’s ideal target market. This use of imagery is meant to help visitors picture themselves in the role. Contrast: Important communication is given a priority on the page. Emphasize what you want the visitor to see and pay attention to first. 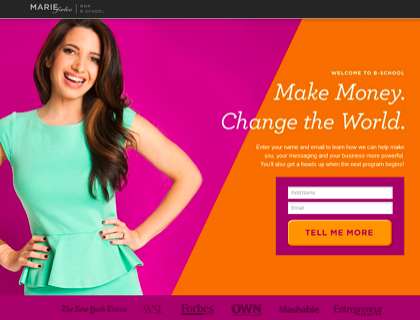 Encapsulate: Marie Forleo encapsulates the form to draw attention to it. The bright pink box and bright yellow CTA draw the eyes towards it. Minimal: No other information distracts from this squeeze page form. The image frames the form so that focus can be put on the centre of the page. Bright: Colour is used to highlight important sections in the headline and also for the CTA button. Prefilled: Each form field is prefilled with instructions to make life easier for the visitor. Directional: A directional cue arrow points to the form to direct attention to it. Proof: Company logos at the bottom add trust and credibility to the offer. Encapsulated: The form is in a bright blue box and the CTA is highlighted in orange. Colour is used expertly here to draw attention to the most important section of the page. Directional: An arrow after ‘continue’ on the button lets the visitor know that this form leads to the second step. Contrast: Words highlighted in different colours stand out from the rest to draw attention. Visual: The large background image frames the form and focuses the attention on the centre of the page. Action: The CTA language implies action ‘Get access now!’ It implies the next step is access to the offer. Headline: The headline on the form directly addresses who this offer is for. The language is simple yet expertly targets its audience. 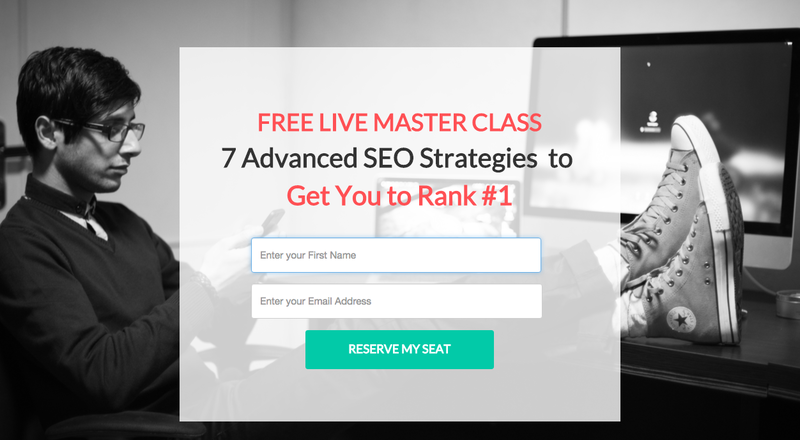 Bright: The bright CTA button colour helps it stand out on a rather bland page. Value: The headline promotes value right off the bat. Language like ‘world class’, ‘specialist’ and ‘doubling sales’ are used to communicate value. Bright: CTA colours help the buttons stand out on the page. Encapsulated: The form is framed in an encapsulated box to separate it from the rest of the page. Encapsulated: The form on the page is highlighted in a bright pink encapsulated box to draw attention. Imagery: The large image is meant to target FabFitFun readers. By using an image of their ideal audience, visitors can relate more soundly to what FabFitFun is offering. Form headline: “A daily treat crafted by Giuliana Rancic” emotes exclusivity. Visitors are receiving access to exclusive emails curated by Giuliana herself. 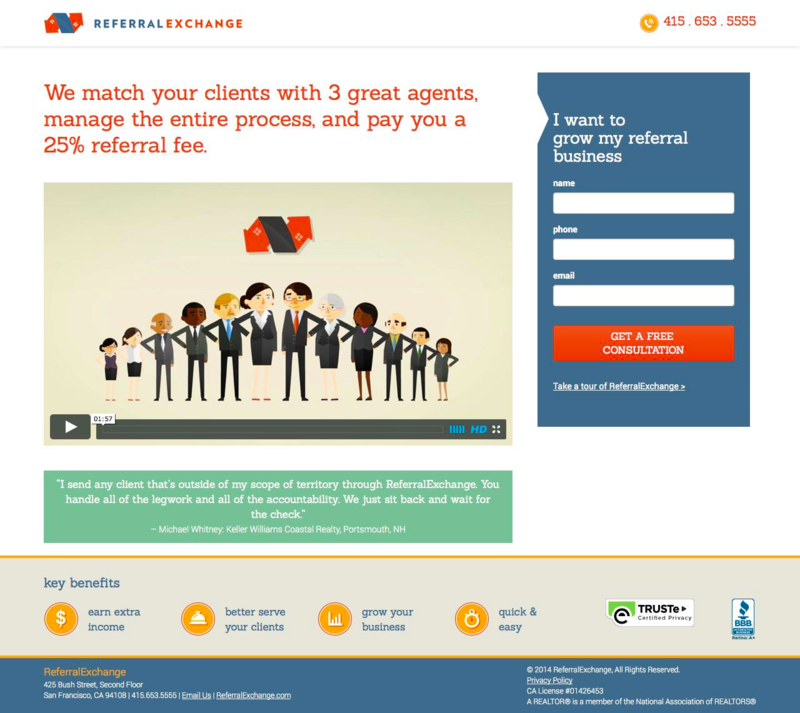 Video: A landing page video efficiently explains the concept and the product for the visitor. High quality video is leaps and bounds more entertaining than written copy. Encapsulated: The form is separated from the content in an encapsulated box to draw attention. Proof: A testimonial from a real user further backs up the claims of the video. Contrast: White text stands out on the brightly coloured background. The CTA is large and demands attention below the form. Proof: Successful company logos are scattered at the bottom to provide more trust and credibility. Visual: The large background image manages to frame the form to direct attention to the centre of the page. Benefit: Instant benefit is communicated in the headline. 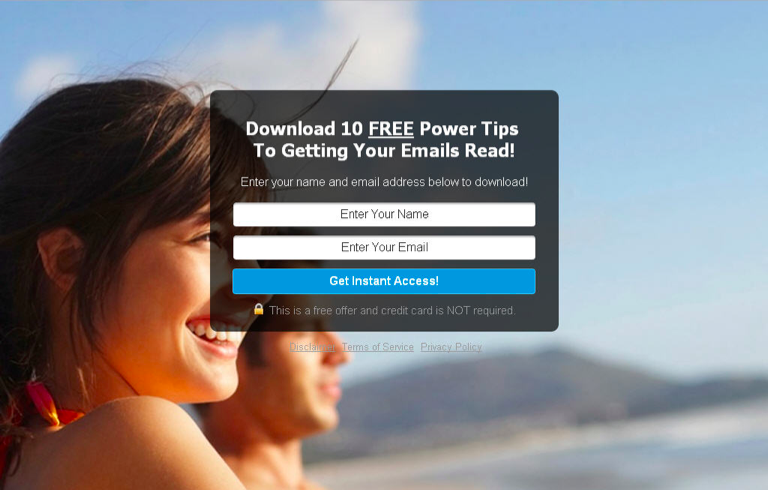 “Download 10 FREE power tips” directly offers free resources to the visitor. Visual: The background image frames the form and adds the feeling of exclusivity. Curiosity: The headline communicates a secret to be ‘revealed’. It creates curiosity as to what the secrets and the offer holds. Bright: The bright orange highlights important words in the headline and makes the CTA button stand out on the page. Value: Eureka Report communicates value by including the dollar value of the free offer. Urgency: The ‘ends midnight’ stamp on the top right corner communicates urgency. Visitors only have until a specified time to claim this ‘exclusive’ offer. 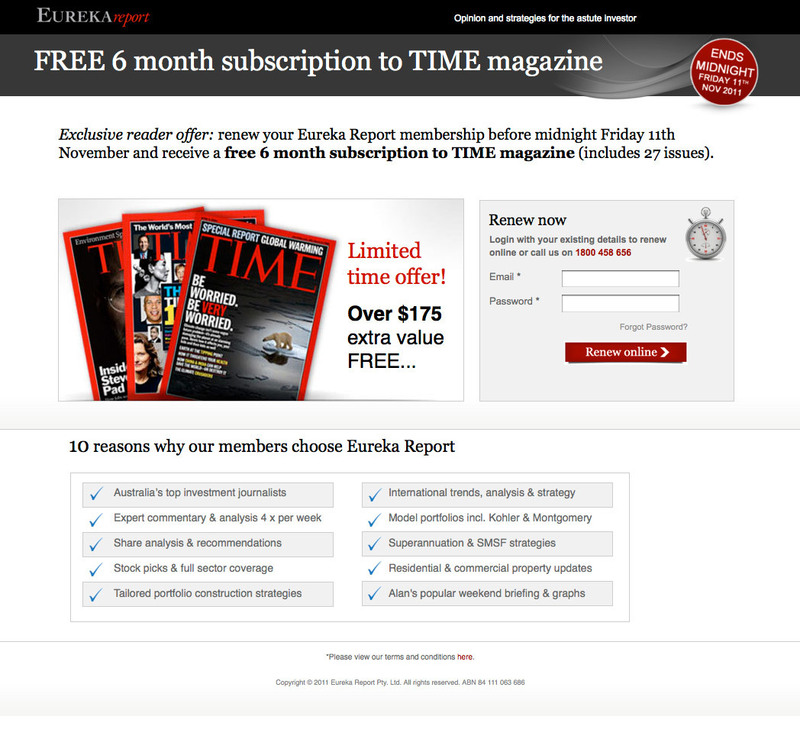 Reasons: Eureka Report includes 10 compelling reasons for visitors to renew in addition to the free Time magazine subscription. Personal: Kirin puts herself front and centre on this squeeze page to add her personal flair to the page. Visitors will know who they’re opting into and receive a hint as to what they can expect from the experience. Value: The subheading communicates value “7 secret, easy, and affordable ways you can go from drab to fab”. The benefit is clearly communicated to the visitor. Bright: The CTA in the white space of the page is made bright pink to stand out from the form section. Encapsulated: The form is encapsulated in a bright white box to stand out from the copy and attract visitor attention. Bright: The CTA is made large and orange so as to stand out and draw attention from the visitor. Drop-down: Drop-down form fields make the process for the visitor easier by selecting their answer. If the answer is open ended, drop-downs can make the process easier for your visitors. 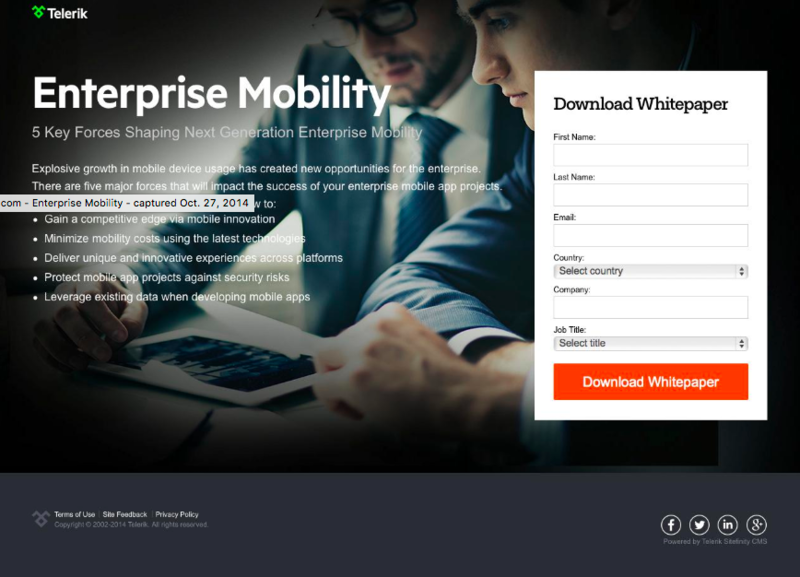 White space: Ample white space is used to highlight the important elements on this squeeze page. Nothing distracts from the communication or the form itself. Action: Action-oriented language is used in the form heading and on the button itself. It communicates action so the visitor knows the next step they’re about to accomplish. 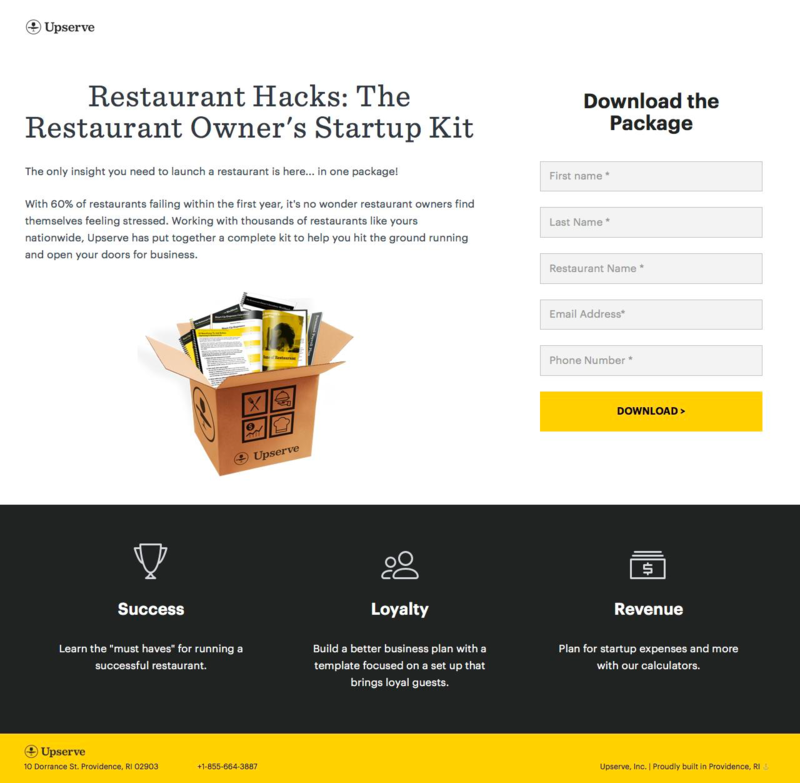 Bright: The CTA is bright yellow to help it stand out amongst all the other page elements. Visual: The large background image frames the form portion of the squeeze page. It draws attention to the center (not to mention make you hungry). 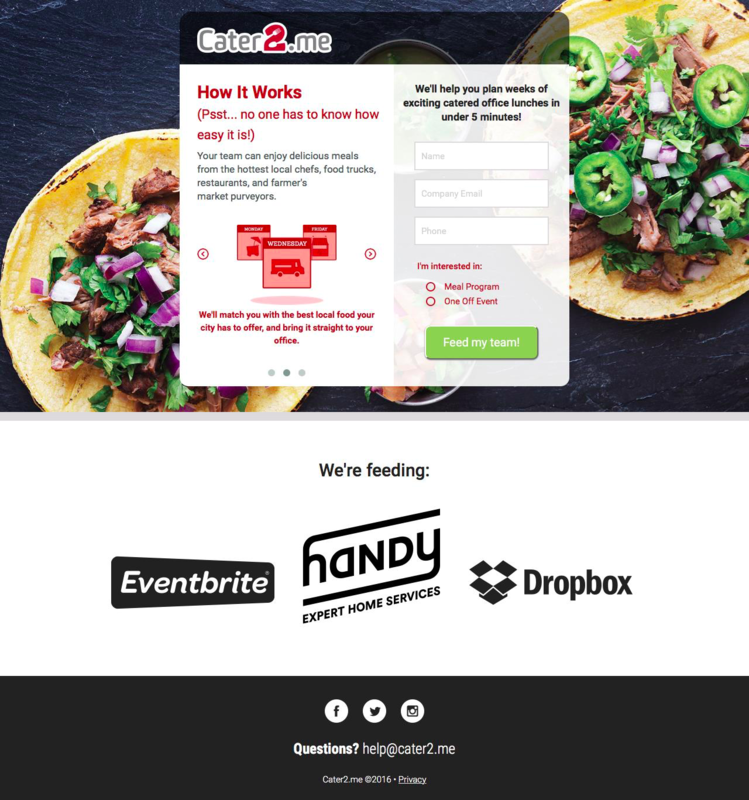 Proof: Cater2.me shows the companies they’ve supplied food to. It adds to the credibility of the service. They also include their social channels for extra proof. Steps: On the left hand side of the form Cater2.me includes the step by step process to use the app. It’s a smart way to give the visitor more insight into how the service works. Directional: The large direction cue arrow below the body copy direct attention to the form. After reading the body copy the directional cue guides the eye towards the right. Proof: There are over “30,000 users in our network” they say. 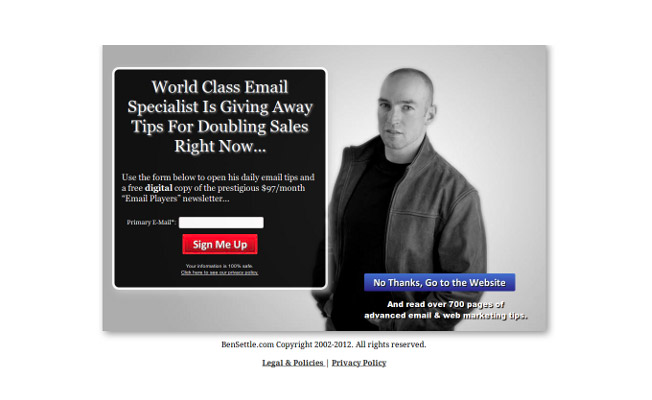 Social proof adds to the credibility of the offer. 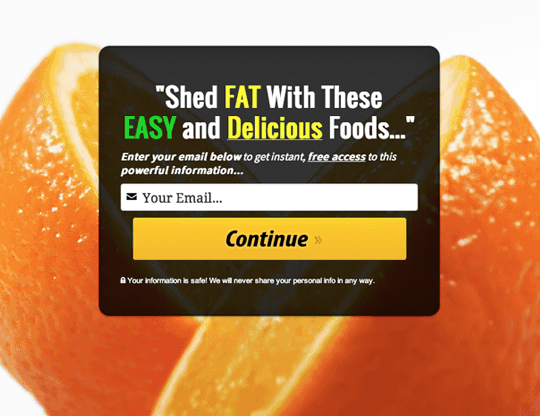 Encapsulated: The form is encapsulated in its own box and adds a hint of bright orange in its headline and CTA. It is doing as much as it can to attract attention from the visitor. 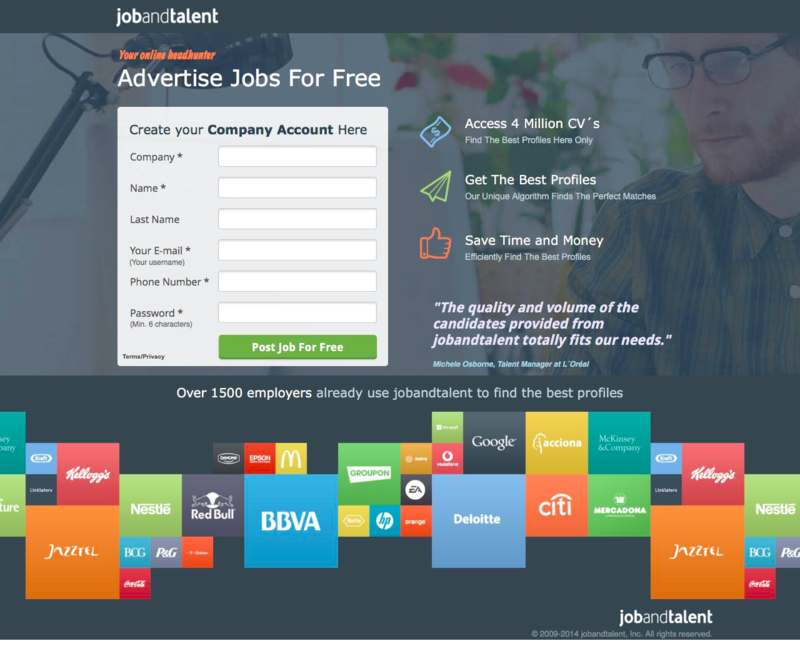 Proof: Companies that have used JobandTalent line the squeeze page for added credibility and trust. 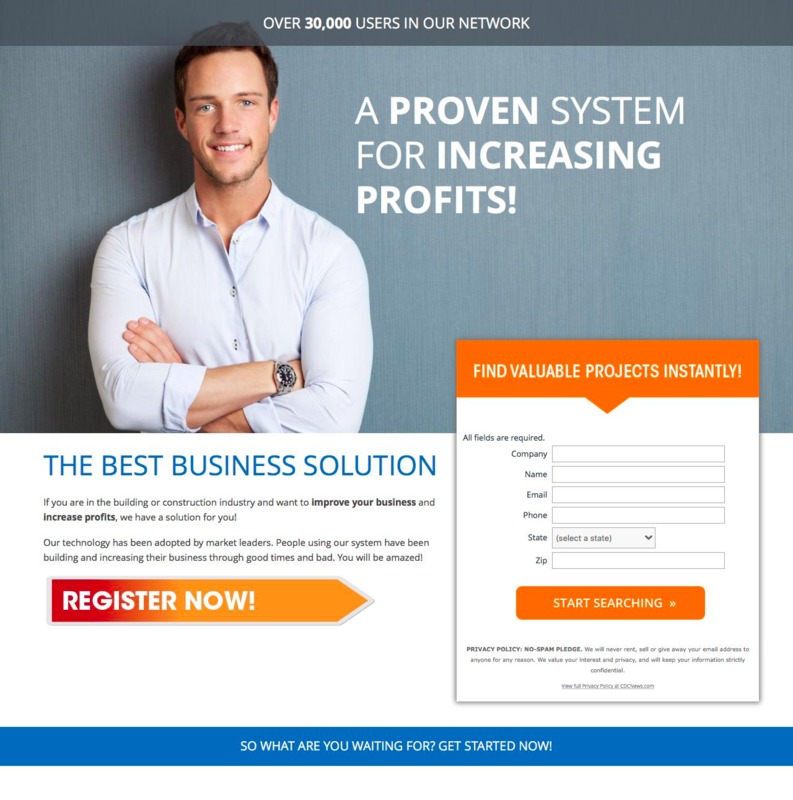 Real testimonials, 4 million CV’s, and 1500 employers further add to the credibility. 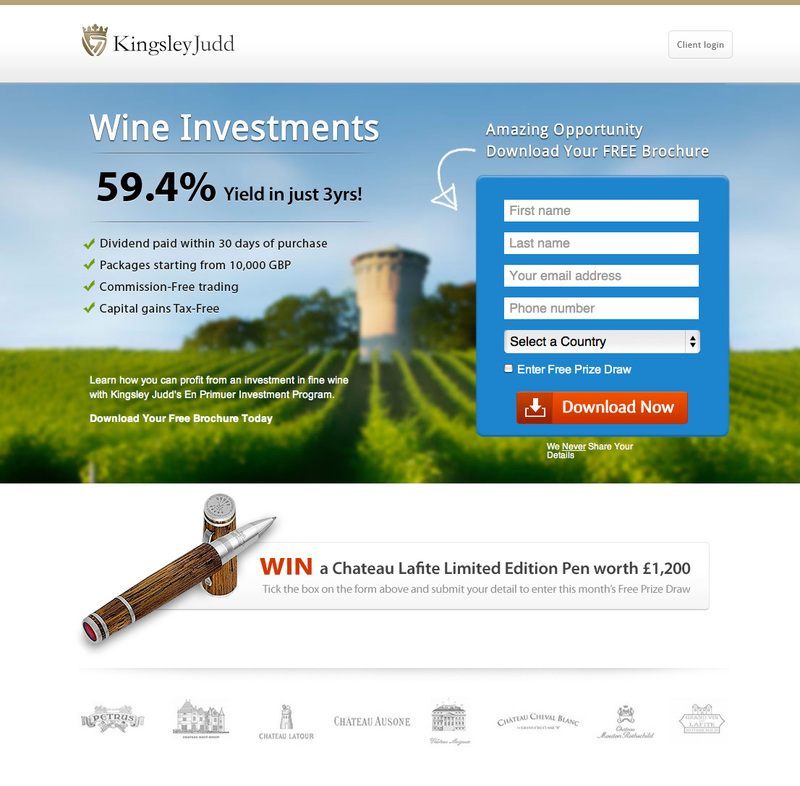 Encapsulated: The form on the page is encapsulated in a box to draw attention away from the rest of the page. Imagery: A large photo background and bright colours surround the form directing attention to the centre of the page. Human: The large hero image adds some personality to the page and a friendliness. 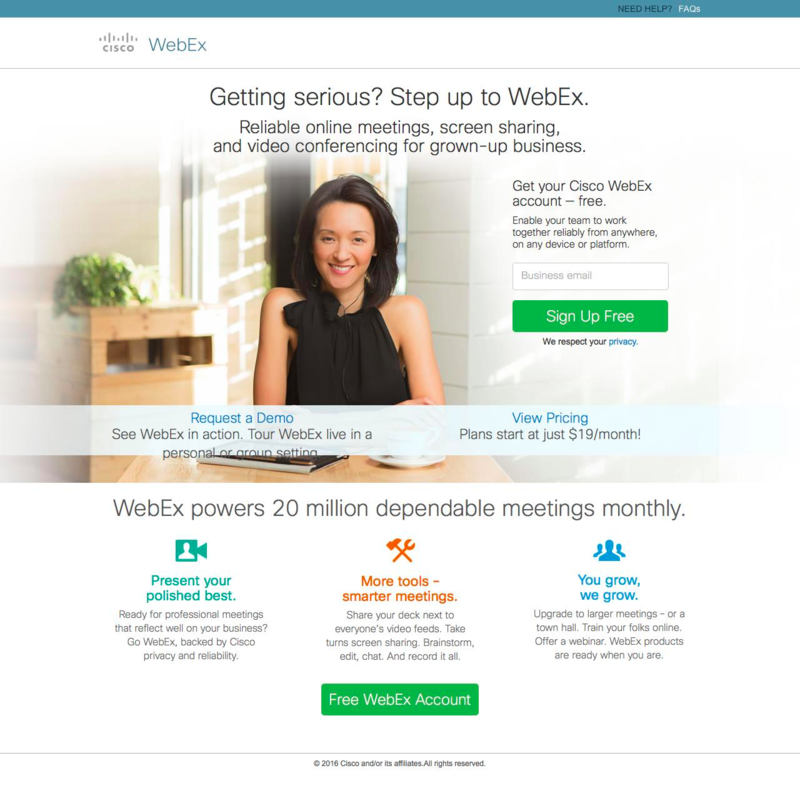 Proof: “WebEx powers 20 million dependable meetings monthly” adds social proof and gives visitors the confidence to convert. 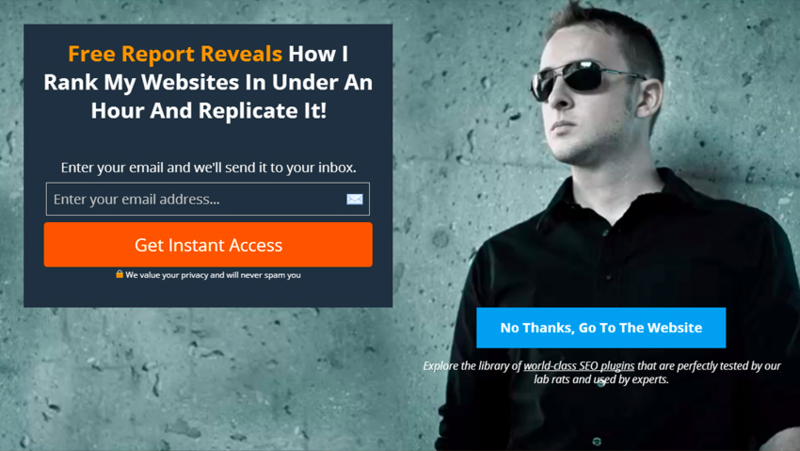 Video: A squeeze page video can add a ton of trust and credibility to the page. 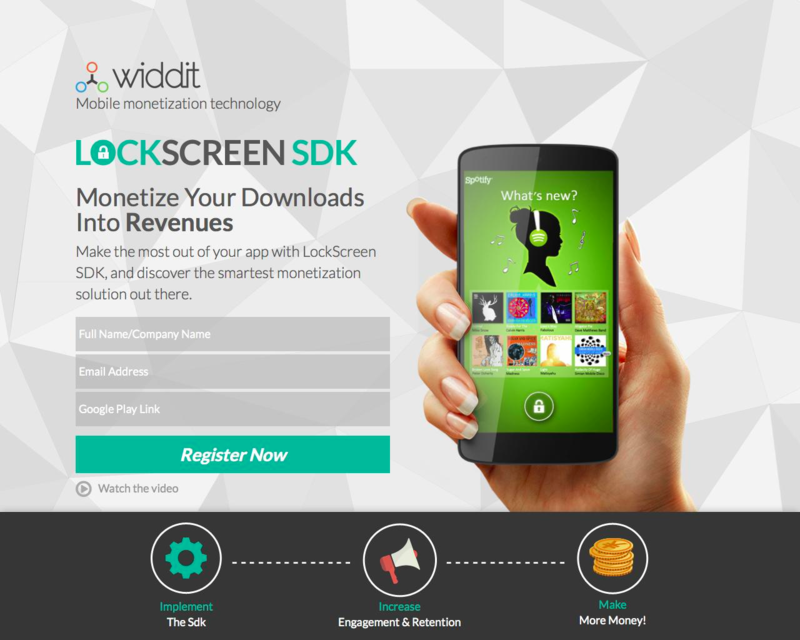 Showing how LockScreenSDK works is a step away from a live demo. Visual: Visuals, graphics and CTAs are designed with bright colours to stand out from the ample white space. Step-by-step: The graphics in the bottom simplify a rather complex product into 3 steps.